A planned explosion brought down FP&L’s landmark power plant in Riviera Beach, Florida this morning. 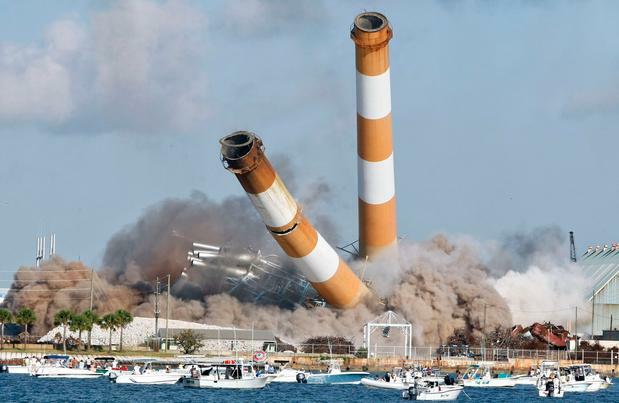 The red and white striped smokestacks that were landmarks for generations of sailors returning home from the sea are now just a memory. The 60’s era oil fired generating plant will be replaced by a $1.3 billion natural gas fired power plant. Said one witness, “Now it’s gone, but now you’ll get cleaner energy, I guess.” Apparently, this gent hasn’t seen ‘Gasland‘ yet. I hope the manatees that warmed themselves there are OK…they were my friends! Hope so too Sophie. At least for now, since it’s summer and the water is probably a bazillion degrees there! Wonder what will happen next winter since the manatees are used to going there for relief from the cold.